The jTBC Mon-Tues drama Secret Love Affair wrapped up today after raking in the high ratings and near universal warm reception. I handed off the recapping baton to dearest jomo for last week’s episodes since I took up two more newly premiered dramas. The result was like peanut butter meets jelly and the readers the happy bread to sample extra servings of her detailed and heartfelt recaps for this lovely show. She’ll be cooking up her fabulous recaps for this week’s final two episodes and I can’t wait to read it along with everyone else! SLA was a drama not for everyone but those who took a chance were treated to a feast for the eyes, ears, heart, and mind. This story was a tour de force that pulled so much out of the actors and the viewers reaped the rewards. Yoo Ah In‘s performance deserved the Baeksang Best Actor nomination, IMO, and it’s a shame Kim Hee Ae was left out of the nominations for Best Actress though I think the academy was trying to spread the wealth since she won last year for A Wife’s Credentials. The episode 16 ending arrived as beautifully as the drama was to watch from beginning to end. Beautiful is such an apt word for this drama even if beauty doesn’t necessarily mean happiness or easy resolutions. The adultery theme was a high barrier to cross to give this drama a try but ultimately the story was about redemption. The very act of adultery, or corruption, of musical epiphany, or paying a steep social price, all were merely catalysts that pushed a world of characters forward to a different place at the end from where everyone started. This drama was never about what happened to characters as much as it was about what everyone felt and decided to do in the journey we spent with them. I was moved by SLA from the first frame until the last having walked alongside Hye Won as she plunged into an abyss and discovered there was more to her life than what she was living. For those who want spoilers on the ending or a place to talk about it early, this is the thread for you to release some overwhelming feels before the final two episode recaps arrive. In the end, Hye Won got her divorce from her loveless marriage of a dirtbag husband Joon Hyung and confessed to her role in the corruption and embezzlement schemes she did for the Seo family. To have a chance with Sun Jae she needed to start from zero and let go of all the chains, burdens, wrongdoings, and mistakes of her past. She chose her path before, she’s choosing it again now, taking agency into her own hands regardless of what others think. She gets sentenced to a few years prison and in her incarceration she is finally at peace and happy, able to sleep soundly even in a cell and enjoy the sunlight from being a barb wire fence. She doesn’t ask for Sun Jae to wait for her, but that is what he chooses to do. In the end, he heads off to continue to his musical career and tells his empty apartment (his home with Hye Won, the place where their hearts reside) that he’ll be back soon so wait for him. It’s a hopeful ending but without any promises of forever and kisses and gaudy rings. Just two musical soulmates who have dared to love and chosen to keep on loving each other. and thank you for the beautiful recaps! I loved this drama to pieces!!! In their last scene together, she behind the jail glass and him just looking at her so intensely… You could almost feel and see him caressing her lovenly with his eyes!! That was W O W !!! They both are an increable actors!! Thank you Sooo much to you & jomo for the recaps!!! It was a lukewarm ending to me. I suppose she had to be punished for her business dealings with her boss but I think the writers may have punished her for her relationship with SeonJae by having the women cut her hair in such a haphazard way as “punishment”. Cutting a woman’s hair is a way to humiliate her especially when it’s forced, one woman was holding her down. I was kind of miffed when HW seems to agree and was so meek about it and made a joke out of the whole thing. the older woman giving her the haircut says just that i believe; it is punishment for touching a young boy (he’s 20 but still…). her reaction to the forced haircut says a lot about her character. she is built to survive and will make do with the curve balls thrown her way. Episode 15 and 16 completely revamp my passion for this drama and brings this drama to another level. What is happiness? Happiness and freedom can only be found through letting go, and this is the precious lesson Dir. Ahn tries to deliver. Kudos to everyone’s hard work!!! something I has not done before, which was to register at the soompi forum just to share my thoughts at the ending :). the ending truly was EVERYTHING I wanted for this ending ( I had an alternate ending I would have accepted which would have been HW hooding to keep her old way of living and SJ leaving her as a result) but this definitely was my preferred ending. back to, not after seeing and experiencing life lived with passion and emotions. her, offering SJ to leave her for me means that she came to this conclusion without factoring SJ by her side in the equation. I love that she wants him to live his fullest life outside and if that includes her, them it’s completely on his own accord, unencumbered by any manipulation of emotions on her part or any obligation he may feel for the position she is in. back to her old life. like watching most stuff right now, exc the fluffiest ones!! hehe Jomo. you’re right! it doesn’t sound so wrong after all! OH KOALA! I love PB&J!!! You are funny and sweet. Just finished 16. I need a big hug. A nice happy one. A BIG NICE HAPPY ONE from Sun Jae with his arms. Yes. All I can say is this would have been one unhappy jomo if HW did not listen to her Sun Jae. Had she picked the Swivel Chair of EVIL at the Desk of Luxury, I would have hurled a Mahjong set at her. Thank you writers! Thank you directors! I am going to re-watch and re-sob out loud for a little now. Could not have said it better myself. Thank you. What a journey SLA has been for me. I watched it “live” not understanding one word of what was being said(unfortunately I do not understand Korean) but I was crying like a baby. SLA was the best K-drama I’ve watched so far. There have been many an “easier” watch, but none that gripped me in this gut-wrenching way. I think the ending was perfect. Just stellar writing. What a amazing group of actors. Feeling bereft. I’m really going to miss Sun Jae. i completely agree! the great thing about “easier” watches is they are fluff and help pass the time. i appreciate the break they give me in-between life. something like secret love affair plucks the heartstrings and keeps you thinking about it long after it’s over. It’s ended in absolutely artistic/ realistic way…but i just can’t bear HW would receive a freaking long 10years sentence that as in HELL!!! Was it a ten year sentence? That hurts. SJ stood strong and with clear insight into Hye Wons motivations he didn’t waver. He drew a line for both of them. His devotion purified her, made her whole in the end. I am so impressed with the writing, the plot, the direction and subtle depth of the acting. It seemed very genuine. It was a gripping pleasure. Thanks to all. Ms Koala thanks for this early recap! As I could feel you couldn’t wait long enough before Jomo’s recaps on the last 2 episodes to come out. Jomo please don’t make us wait for too long my eyes are itching now to read your review and run down for flooding comments after each of it. I wanna raise my roof for the whole cast and team of SLA, this is the best drama I’ve ever seen not just in the Korean drama category. With the superb acting, eloquent cinematography, intelligent directions of the Director, perfectly picked musicality…there’s so much I wanted to describe but I ran out of adjectives to choose. I can not compare this with any other drama, it touched my inner being and made me realize and not criticize. Congratulations SLA! A perfect 10! i haven’t watched ep16 with subs yet… there are so many posts on soompi mentioned 10years jail time…that’s killing me… if this was not true then i can rest my heart in peace. thank you!!! So was it all hearsay and that the cell mates didn’t truly know the her life sentence. What the other one said about the prosecutor making a deal so that he can catch a bigger fish rule out the 10 years life sentence? Well ’twas only HW’s cellmates speculations based on what they assumed and learned about her case. This part of the episode left us the impression of the vague time HW is going to serve inside the prison could 10 years or less, and in some way made us viewers decide on our own how see it through of what lies ahead for HW being inside the prison seeing a total transformation of her life. secret love affair did not immediately register on my radar. in the midst of finals, i turned to something i hoped would allow me a momentary break from reality. i believe i got more than i initially bargained for; my hour long break turned into 14 on the weekend and two more to finish the series off this week. i plan on re-watching this again so i can appreciate it fully without rushing. i must say i now understand why the drama was nominated manifold and i think the baeksangs (sp?) did a great disservice in not nominating kim hee ae. forget spreading the love, recognize acting excellence. yoo ah in and kim hee ae will be remembered for their roles long after they have moved on to different projects. Hands down one of the best dramas I’ve ever seen. The best for a noona romance. The dedicated folks over at Soompi just created a special blog for SLA. They’ll collect script translations and other important stuff that would get lost in their thread. It’s a labor of love from some very enthusiastic fans and I’m very grateful they decided to archieve all this background info. Thank you very much! oh thank you so much newbie for the link, Im gonna visit this now! THE BEST DRAMA OF THIS YEAR!!! I SO FRIKKIN LOVE THE ENDING! This is a story about making a choice and renewing your own path! Thank you KOALA’S PLAYGROUND for your courage to recap this beautiful heartwarming drama when the others were even afraid to watch it! Easily the best drama of 2014. I dont care about populatiy votes for other dramas being called the best drama so far but this one is another level of all i have seen this year. It was way too special, too real than what is the usual in the world of making k-dramas. I cried watching the last scene. Because I’m happy. Just finished a marathon of SLA episodes and it’s 3.30am. Quickly checked in on ms koala’s recap as I watched ep 16 without subs to try to understand what the hell was going on in that last episode. Though, I was a mite disappointed that there wasn’t an epilogue with a glimpse of the OTP being lovey dovey, I’m glad the ending ended the way it was. I agree with Ms Koala, how it was perfect without the promises of forever and kisses and gaudy rings; the ending was more realistic. Hye Won had the chance to run away when Sun Jae urged her to several times but she chose to turn herself in so she could have a clean slate. I think she needed to show SJ this as well as this was the mature thing to do and to start over from zero. I love the part (was it ep 15?) when SJ said to HW, “I know the life expectancy has now rose to 100 year old, but would you spend the next 60 years without love?” Honestly, I love every details in this drama (if you can call it a drama, more like an art movie). The way the music represented every dialogue, scene, and emotion. To the contrasting wardrobe of SJ and HW. I’m glad they dressed SJ in basic basic clothing, down to his very dirty worn out shoes. The way this drama, especially Yoo Ah In’s acting has pulled my heart strings, I will definitely be revisiting the drama in the future. I hope Yoo Ah In win Baeksang. He’s so talented. Lastly, thank you for the recap! Ever since I started watching SLA, I’ve been reading the recaps and all the comments, also comments on Soompi, religiously. I’m going to miss reading the comments and the insights… Thanks again! A very beautiful drama that captured all my intention, regardless the piano songs, the silent, the every moments, I felt them, so quiet , yet intense!! It’s a very successful korean drama I ever seen! I have watched many Korean dramas altho less and less due to their predictability and their teen story lines. There is no question but that this is the best drama I have seen…. thanks to the writer, director, YAI and all the actors. What a wonderful ending. 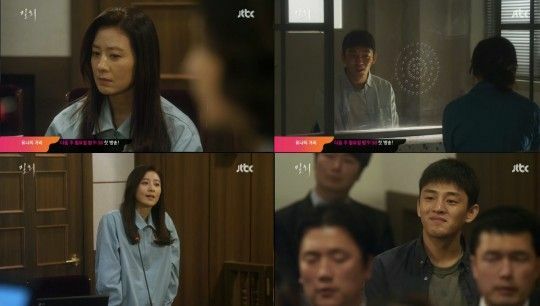 The look on Sun Jae’s face in the courtroom was mesmerizing as was Hye Won’s face in the prison yard. The stories of older women and younger men is not so unusual, but because of society’s frown, they are usually hidden. In dramas, they are treated as comedy. SLA broke so many barriers. It was truly an amazing experience to view this. Thanks again to the entire staff of SLR. I have seen around 70-80 korean dramas and i have rarely seen one as beautiful as this one, a drama which was great from start to finish. The 16 eps felt like a long calm,well acted film. Not single episodes. Usually korean dramas tend to have weaker ending than start or lose the quality in a part of the series. Great acting, writing, directing. More unique cable dramas like this please rather than 99 current revenge dramas, predictable melodramas…..
And I love love love love that HW chose the rite thing and her awesome speech! “Everything does pass. Being able to endure it well while it’s passing by… That’s strength..” And her strength is her love from SJ! They will be together no doubts! Cause HW is SJ eternal variation!!! In my fair tale ending I was hoping to see them going to town and town in a truck touching ordinary people with their powerful magical music.. I loved the series but I hated the ending. How typical the self sacrificing female. Not only did she go to prison for god knows how long but you changed her whole demeanor. There wasn’t a hint of the proud women she once was but did you have to change her into an uneducated speaking broad. What a cop out. I felt the same way too, in a way it such a let down since I personally felt that the ending was done in rushing especially episode 15. We are talking about smart woman here. Actually I have a feeling that Sun Jae is no longer loves her likes he used and start acting his age even how much he caress and kissed her. However after her sacrifice he decided to be with her again (or may be it just me). At least that what i felt when they are together, the feeling is not the same as in episode 4 and episode 8 where I felt that he really loves her so much. But to be honest, this the only kdrama that I really pray God so the writer gives mercy for the characters to be together. Well it does..they will be together only in the future and we are not allowed to witness it..
Well finally after lengthy rambling..its such a superb drama I ever watched in my entire life, such an art that make me pause my pc so many times due to suspense and tension, and its only a love story. a beautiful drama with a great ending. love how SJ is willing to wait till HW out of jail so they can date. YAI acting here is great. YAI/KHA can act together again cuz their onscreen is sizzing. this drama i hardly skip. other i skip to see the lead couple only. i loved the drama a lot and felt the ending was satisfying but i have to say that the drama made characters all good or all bad with the one exception of hye won who ended up a saint. why would such a realistically made drama do that — people in real life are somewhere in between. though very artistic and touching, i felt the drama was not realistic in terms of its characterization. but then i thought perhaps the drama was about the transformative power of music and sun jae was merely the vehicle for this. what is the use of struggling and practicing and becoming perfect in this difficult music from another era if it does not purify your soul in some way? the drama rediscovered for me the true meaning of music. thank you so much koala and jomo and all of you for the wonderful recaps and descriptions! you work so hard for us fans!! How could this series have low ratings, I wonder. Perhaps because of the stigma that the word “affair” holds. This series is done in no way audacious, and causes one to just drop the word affair in “love affair” and make one believe that it is just love. The characters were very convincing; the 20-yr old guy did his best i.e. while playing the piano, the 40 yr old woman plays her character elegantly which makes you feel that she’s a goddess from somewhere, and even down to the scene of her drunken husband… Oh and another thing, captivating music. Am sorry dear, but I beg to disagree with the low ratings..actually it turned to waves as its ratings fluctuated each episode which is no ordinary for a cable channel drama. Nope, as a matter of fact the ratings of this drama are the highest among all programs in cable. You must remember that this is the cable network aka paid TV, so not everyone can watch. SLA got around 4-6% ratings each episode, and it was considered really high. Even 2% is high. arghh… it’s over, beautifully. i’ll move on with my life then. Love, love, love this drama. In fact, this is the first that I actually plan to rewatch. I have never done that for a K-drama (only for TW drama Meteor Garden). I fell in love with Yoo Ah In, who is an amazing actor. I felt SJ’s love for the music (as a fellow musician) and his love for HW (whom I was jealous of, lol). Now, it has set the bar so high, I have problems watching any dramas without comparing it to SLA!